Is your goal to have excellent credit? All of the factors above can affect your credit score, however, the following four factors have the biggest impact. You will be able to use these four factors to quickly improve your credit score once understanding how they work. When you apply for credit, whether it’s a home loan, car loan or any type of credit at all, a hard inquiry shows up on your credit report. Hard inquiries are OK to have on your credit from time to time, but lots of hard inquiries make it appear as if you are over-applying for credit in an irresponsible way. Your credit score will go down due to a large number of inquiries appearing on your credit. The good news is; hard inquiries only stay on your credit report for two years. And, their adverse effect will fade over that two year period. Also keep in mind, if you are car shopping and apply for financing at three different dealerships within the same week, the algorithm that generates your FICO score knows to only count this as one. How much can hard inquiries lower your credit score by? 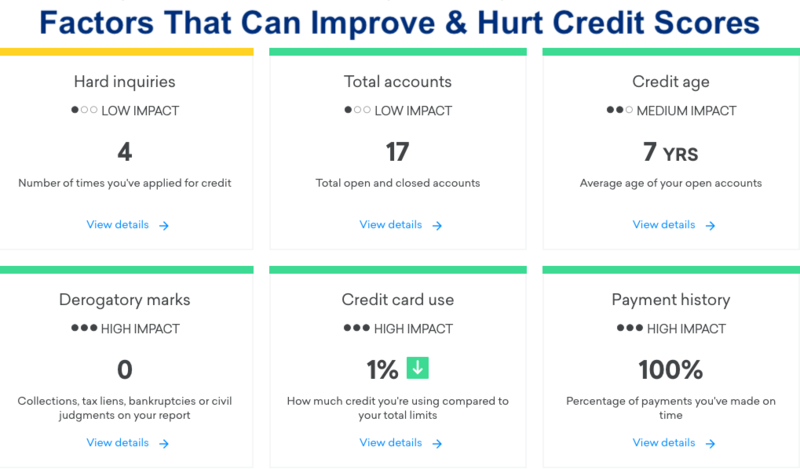 CreditKarma.com explains that “credit mix” makes up 10% of your credit score. It means lenders like to see that you can responsibly manage a variety of credit accounts. For example, having a car loan and credit cards that you pay on every month will help improve your credit score more than if you just had credit cards. There are three types of credit; revolving, installment and open accounts. Your credit score will increase faster if you can generate positive payment history on all three types of credit, versus only having one type. What happens when I close a credit account? If you close a credit account, like by closing your Macy’s credit card, this action will hurt your credit score. 1. You no longer have that credit account open to help lengthen your “average length of credit history”, which makes up 15% of your credit score. By closing a credit card you shorten your length of credit history. 2. Your total available credit is immediately lowered after closing a credit card account, hurting your credit utilization ratio. Credit utilization ratio is positively affected by lowering balances on accounts and by getting credit limits increased. In this next example, this client’s credit score improved by 11-points just by decreasing the balance on these four credit cards. To improve your credit score you want to keep accounts open and continue to use and pay them in full every month. 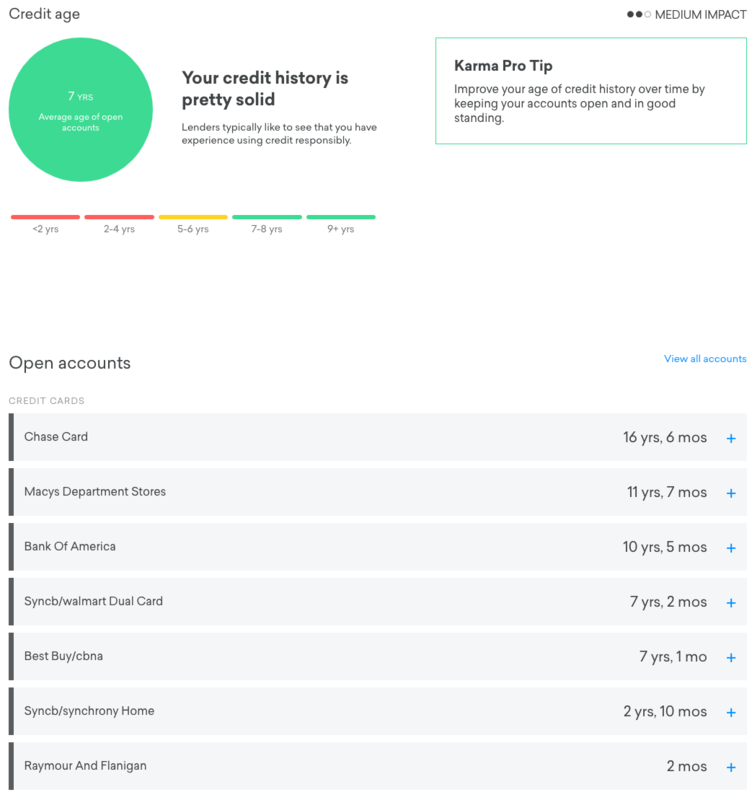 The longer you keep an account open, the more of an effect it can have on your credit score. If you are paying on your accounts on time every month, the effect will be a positive effect, but if you are often late on payments the effect will be a negative effect. In the client example above they have a nice variety of accounts that on average have been open for seven years. Never close a credit card because that shorten’s your average credit age. 4. How much will late payments and collection accounts hurt your credit score? Late payments and collection accounts hurt credit scores more than anything. After missing one monthly payment and going delinquent by just 30-days, you can see your credit score drop by around 100 points. If you let the account stay delinquent, eventually it will go to collection status. Your credit score can fall by 150-points if you let an account go to collection. You will probably see the biggest drop after going late on your first payment but it will continue to go down as you become more and more delinquent on payments. Every time you fall another month behind, a negative notation goes onto your credit report. … 30 days behind, 60 days behind, 90 days behind, and will stay for seven years. How low your credit score will go, also depends on what your credit score is today. If your credit score is 800 today, your credit score will take more of a hit than if it was only 680 today. For that reason, you won’t find a direct answer to this question. Can collection accounts get removed from credit reports? Yes, collection accounts can get removed from your credit report. You can dispute the debt with a debt validation program and if your creditor doesn’t prove it’s valid the debt becomes “legally uncollectible”. This term simply means, the debt no longer needs to get paid and the creditor can’t legally continue reporting it on your credit report. Does your creditor have all of the documentation that they need to have in order to legally collect on the debt? Is the balance accurate, void of unauthorized charges? Has your creditor violated the FDCPA? Has your account been part of any fraud that you may not know about? And I could go on and on with the questions being asked with debt validation, but legally creditors need to respond or agree to stop collection on the debt immediately. Even if they can’t produce even one single page of a particular document that’s enough to prove the debt to be valid. For example, you can request the original agreement that you signed with a particular creditor and if they can’t produce that original document with your signature, the debt becomes legally uncollectible. Unfortunately, if you dispute a debt and it remains on your credit report, your score will go down even further and it will illustrate that you disputed the debt but that it was proven to be valid. Future lenders frown heavy upon this. Contact Golden Financial Services for a free debt relief consultation. Let’s see what the experts can do to help you! You can speak with an IAPDA Certified debt relief counselor at 858-605-6196 for free. For more information on how to improve your credit score visit this page next.